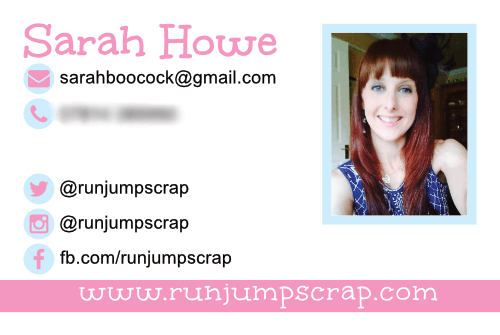 Sarah got in touch whilst on holiday asking me to design her a set of business cards so she could get them printed as soon as she returned. 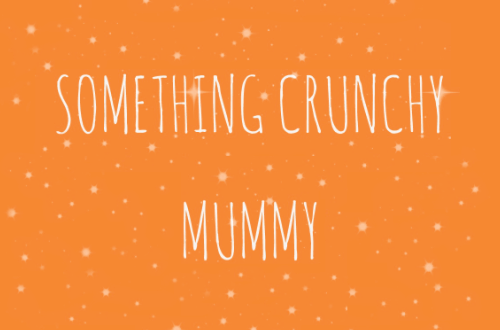 I worked with her on the design and then put in the print order for her myself to make sure she would get her cards on time for the Britmums Live blog conference. 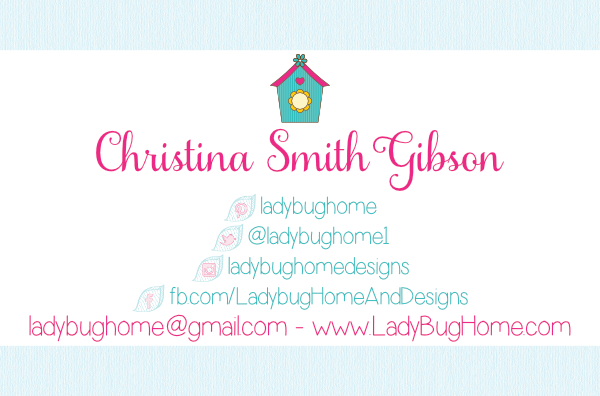 I used graphics and styles from her site to create these cards, editing the header image in order to move the site tagline down beneath, so it would be readable on the small business cards. I created social icons in the same style as her site, with additional icons for email and phone to match. 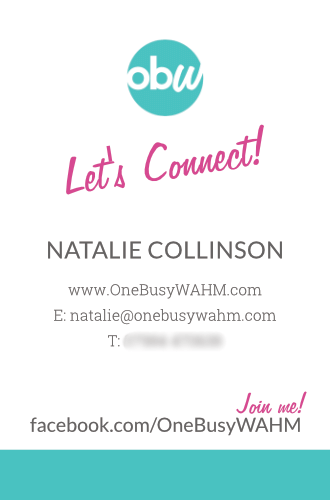 Natalie needed some new cards for her site, and had a good idea and draft of what she wanted, but needed it converting to a print-ready format, and tidying up and tweaking to perfect the design. 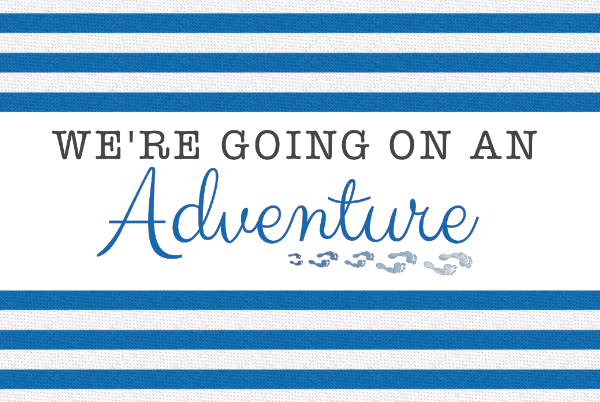 I took her ideas and made some changes to deliver pdfs ready for printing. 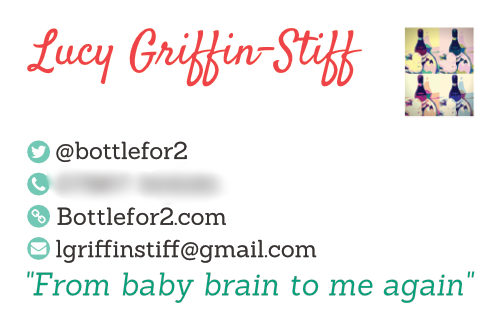 I used some fonts from her site so that the cards work well with her website design. 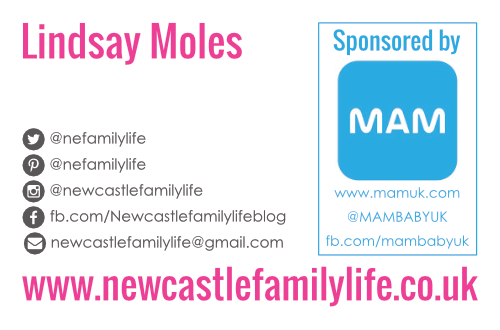 Lindsay got in touch after some business cards for her blog, and needed to include her Britmums Live sponsorship information. I used the MAM colour for the sponsor information, and added a border around their details to separate it from Lindsay’s details. For her logo side, I used her site background to add some stripe detailing, as well as extending her header graphic to make sure they didn’t end with blank space either side, and added her tagline below her logo, in the same font & colour as on her site. 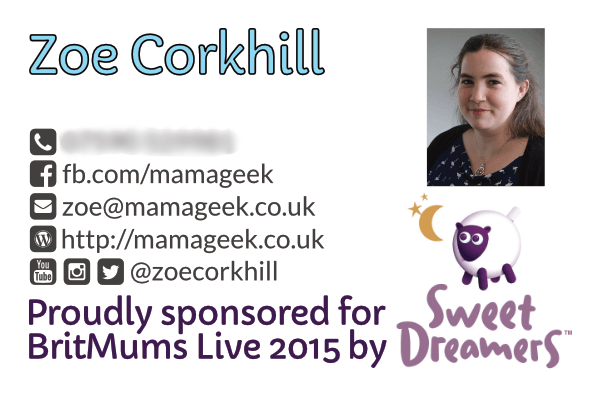 I needed some new cards for my personal blog which include details for Sweet Dreamers, who are sponsoring me to attend Britmums Live 2015. I recently updated my blog design with a refreshed logo and responsive layout, so wanted to use my new style for these cards. 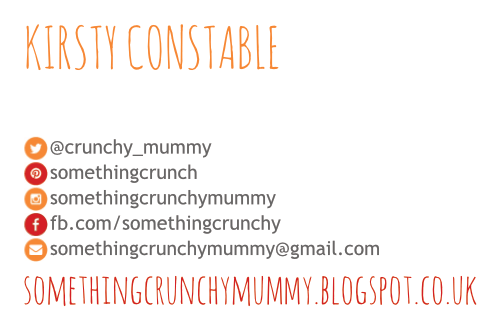 I also included my headshot and all of my social details. 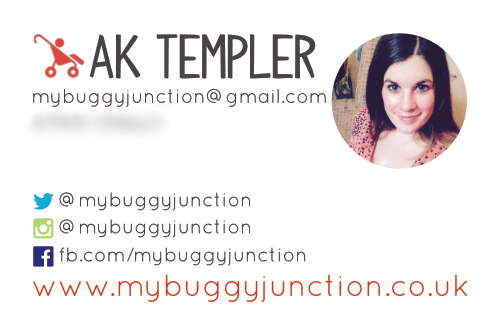 Jaime needed one business card design for two sites – tricky! 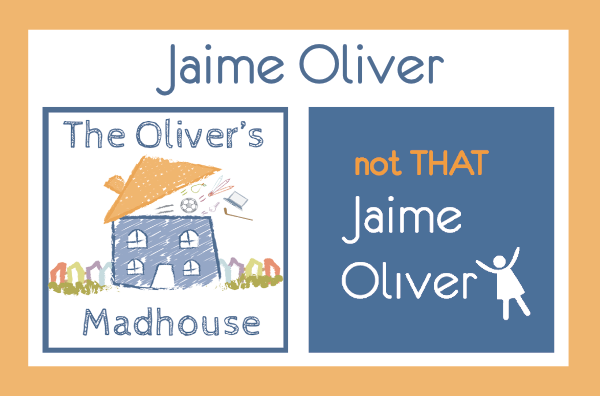 Jaime has two blogs; The Oliver’s Madhouse, and not THAT Jaime Oliver, so she needed a card that brought both those sites together without being too messy or overwhelming. 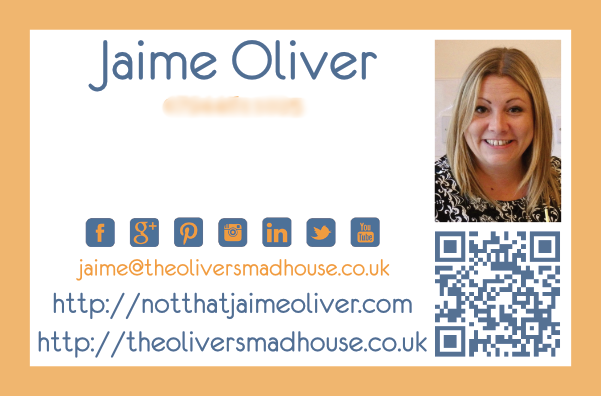 As there was so much information in terms of social media links, I created a quick landing site for Jaime using WordPress and generated a QR code to put on her cards. This left the vital info for the card; name, phone number, main email address, and her two blog addresses – and her photo. Social icons let you know what networks you can find Jaime on, and scanning the QR code with your smartphone sends you to the site with all the links. 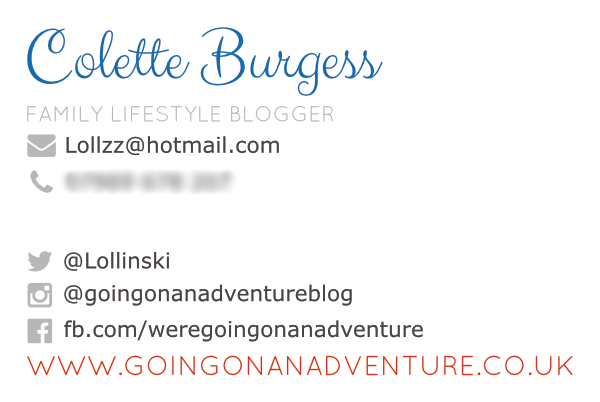 For the logo side of the card I opted to use square versions of her site logos and her name, rather than them being one on top of the other. Colours are taken from both blogs and happily work together nicely, and we chose to stick with one font on the back, using the more readable font of the two. I did Colette’s Media Pack for her a little while ago, so when she wanted a business card design to match, I was happy to help. 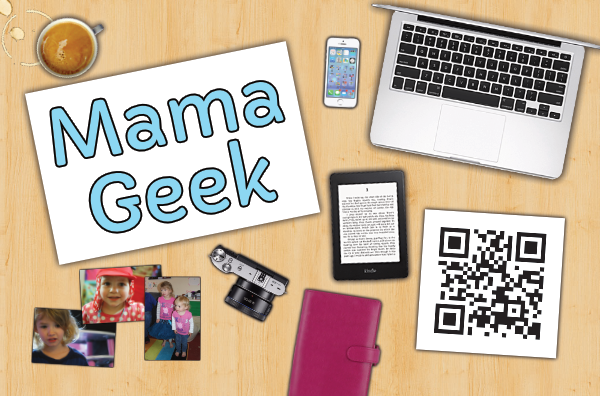 I used graphics, fonts and colours from her website to keep the branding consistent. Simple social icons from font awesome gave context to the usernames without adding too much bulk.